Bibione travel guide with information on hotels and restaurants! If in search for a top beach resort enabling unforgettable vacations, Bibione might be an ideal option for such tourists, given that it is the third most popular beach resort in Italy. Despite the fact that, administratively speaking, Bibione is a mere district of San Michele al Tagliamento, it is an undeniable tourist force on the map of Italy. Bibione appears to be breathtaking as soon as the tourist sets foot in this seaside resort. Both nature and the work of man have contributed, and still do, to the tourist asset of the place. Bibione is the living proof that pine forests can blend into the same coherent picture with beach volley and surfing; that orchids, on the one hand, and shopping and spa treatments, on the other hand, do not necessarily antagonize each other; and that, eventually, idleness while sunbathing or the dynamism of the many sports opportunities can very well accommodate with the oenological pride of the place. By force of such features, Bibione is highly unlikely to fall short of any tourist’s expectations. One might state that the identity of nowadays Bibione has started to delineate only as from the 1960s, and they would be right. Historically speaking, Bibione did not stand out in sharp relief by great political or economical significance, given that it was one of those places which underwent the history made by others. The historic trajectory of Bibione was dictated, alternately, by the greater powers of Rome, Venice, France, Austria and, finally, Italy, Bibione standing out all this time as a mere fishing village of no particular interest. Yet, in less than half a century, Bibione has become what it represents at present, namely, a top holiday destination the popularity of which seems to constantly increase. The one 5-star luxury hotel in Bibione (the Savoy Beach Hotel) is the most inspired choice one can make if in search of maximum splurging and comfort opportunities. Yet, Bibione is far from being an exclusive destination. The five camping sites it hosts substantiate the fact that this resort knows how to welcome all its tourists, regardless of their financial limitations. Other accommodation solutions are yielded by the apartments or residences for rent which always comply better with the objectives of those who have a penchant for untroubled privacy and who, at the same time, are willing to self cater. Given the success Bibione has to a tremendous tourist flow, visitors might want to book or to rent a room in a timely manner. Given the attention authorities pay to all details related to tourism, one might always expect to find the same sharpness when it comes to eating and drinking. There is a plethora of restaurants which service the gastronomic pursuits of all clients, but once in Bibione visitors should focus on sampling dishes the main ingredients of which refer either to fish, white asparagus, Arborio rice or, why not, to all of them, since Bibione excels in the catching and production, respectively, of such foodstuffs. Furthermore, the production of wine is carefully supervised by the competent authorities, which is why sampling some of the local offer will always crown a rich meal. People with a penchant for wine drinking should get to Bibione in September when the famous Septemberfest takes place. Bibione is so well fitted with leisure opportunities that one can hardly make time to tick them all off. Starting from the 8 kilometers long and 400 meters wide blue flagged beach and ending with the nearby attractions, tourists will always find something to catch their attention. Thus, beach sports – such as beach volley, beach soccer and beach tennis – and water sports – like windsurfing, sailing, paragliding or mere surfing and swimming – are complemented by water gym and open air dancing only to turn sunbathing into a more dynamic experience. Shopping is rich and alluring enough in Bibione to make tourists forget, even for a short moment, about the beach, whereas nightlife overwhelms by variety: clubbers and tourists with a penchant for dancing, romantics who get a thrill out of fine conversations accompanied by a glass of wine, as well as music enthusiasts are all taken into consideration when it comes to nighttime activities. Aquasplash and Gulliverlandia must also be ticked off if Bibione proves not to be as big as expected in terms of fun-enabling facilities or if one simply wants to explore the surroundings of this resort. The Zoo of the nearby resort of Lignano pertains to the same category of attractions. A very precious asset of Bibione refers to its spa center, Bibione Thermae, which is, in fact, an autonomous establishment regardless of the tourist profile of the resort. Thus, holidaymakers might also want to resort to the services and facilities provided by this spa center, of which the most notable are the prevention treatments, the mud baths, the inhalation treatments and chromo-therapy, not to mention hydro-massage. Besides the spa center as such, tourists will be surprised to find out that, in fact, Bibione enables by all its sports activities facilities the wellness of its tourists, more than 10 sports events being programmed for 2010, encouraging visitors to stay as fit as possible. Last, but definitely not the least, nature is, in fact, the one which yields the charming background of Bibione, being the one to underlie the tourist performances of this resort. Besides the beach as such – which is partly the gift of nature and partly the work of man – Bibione takes pride in featuring a most enchanting pine forest replete with rich fauna and flora, the highlight of the later being represented by the wild orchids still growing in this area. 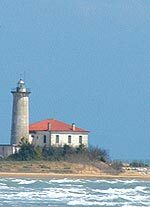 What is truly poignant about this forest is it had, somehow, managed to stay unadulterated by the touch of the tourist boom and that certain human establishments – such as the towering lighthouse of Bibione and the typical casoni – blend perfectly in the natural scenery of the place. Sand Xtreme Challenge is organized by Motoclub BB1 Bibione. It is held in late March, and it grabs the attention of keen bikers throughout the Europe. The beach, the golf club, the wealth of fun parks and the spa center: the fixings of a memorable vacation in Lignano Sabbiadoro. It is located 32 km from Bibione. Portogruaro makes for an ideal destination if you want to change the beach for a completely different urban set. Hit the board and wait for the perfect wave. Or come aboard and take a sailing course. You can do all that in Bibione, if you truly love the sea.